It's surprising to me I'm writing the words that KPRC 2 reporter Ryan Korsgard is leaving the station and Houston. To me, Korsgard seems like the kind of reporter who is a rock for a TV station. After all, he's been at channel 2 since April of 2003 and beyond that he received his Eagle Scout award at age 12 (among one of the youngest with that honor). "I came to Houston knowing only one person in one of the largest cities in the country," Korsgard told mikemcguff.com. 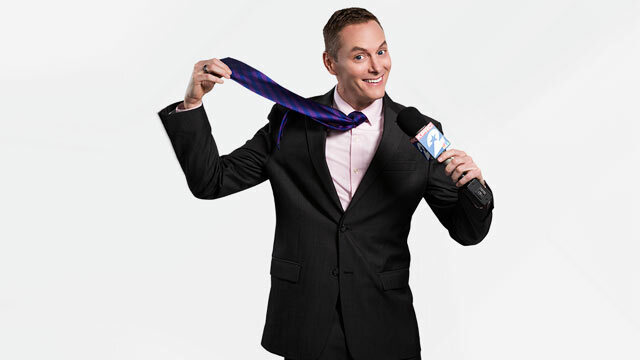 "KPRC TV and my new friends at Channel 2 quickly made Houston home. Now I leave a station and city I love and adore." It's not a tv news job that is taking Korsgard away from us, but his upcoming marriage. "Now I return to Austin and the Texas Hill Country to make a home with my fiancé and to explore the next step in my professional career," Korsgard told me. Before his award-winning work in H-Town, I remember seeing Korsgard as a reporter at the old Belo days of KVUE 24 Austin. Prior to Texas, he worked five years at WAFF Huntsville, Alabama. His television news career actually started way before that. "After watching space shuttle launches, breaking news and political coverage on television, I knew I wanted to become a reporter," Korsgard said in his bio. "Thanks to a very understanding news director who became my mentor, at age 16 I began spending my weekends hanging out in a television newsroom." So at just old enough to drive, Korsgard started working as a reporter-intern at a TV station near his home in southern Oklahoma. He worked there on the weekends as a high school senior. After that broadcast training, he attended Oklahoma Baptist University. All of this experience led him to cover NASA and the space industry for KPRC. His reporting work allowed him to cover two space shuttle launches and a supersonic flight aboard the Concorde from Paris to New York. "Channel 2 is a special place that allows me to cover NASA and our space industry," Korsgard told me. "This is one of the few places on earth where this is possible. Through hurricanes, floods and rocket launches, my friends at KPRC have become family. I will forever be thankful to Graham Media and KPRC for the opportunities they’ve offered during my nearly 16 years in Houston." His last day will be January 19th, 2019. Say goodbye to Ryan here.